I love making “to do” lists. Day after day, I write down all the things I have to do. I usually write them in a spiral notebook because I can quickly jot them down. If I tried to create a list on my iPhone or iPad Mini, it would take me forever. Simply put, writing a list by hand is just faster for me than trying to create it digitally. One would think that there would be an app that would allow you to write notes by hand and then somehow have them digitally filed in iTunes, Evernote, and even email. As far as we are concerned, having good files is the first step to great success. A company called ImprovElectronics understands the need to hand write notes but is a strong advocate of a no-paper society. That’s why they developed the Boogie Board Sync, a tablet that accepts handwritten notes and then automatically converts them to digital files. 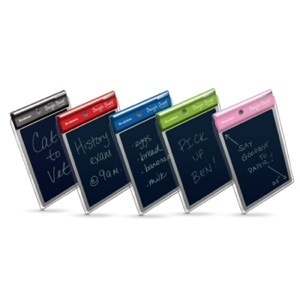 The Boogie Board is a 9.7-inch LCD eWriter that comes in a variety of models. None of the Boogie Boards use paper or pens. 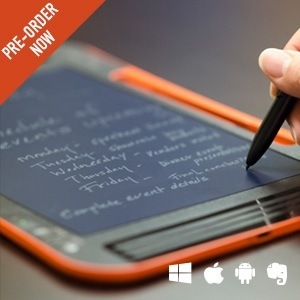 You can even use your finger to write and draw. 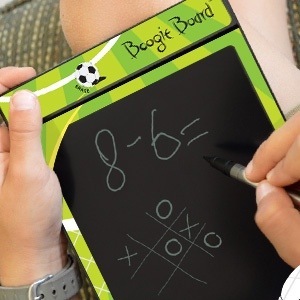 The Boogie Board Sync 9.7 eWriter saves or transfers written files to a computer, tablet, smartphone, or other mobile device wirelessly via Bluetooth. The company claims that one Boogie Board eWriter will save over 50,000 sheets of paper. Not bad!